I don’t think this has been in any way encouraged by Lego’s PR team, but it certainly won’t be unwelcome. 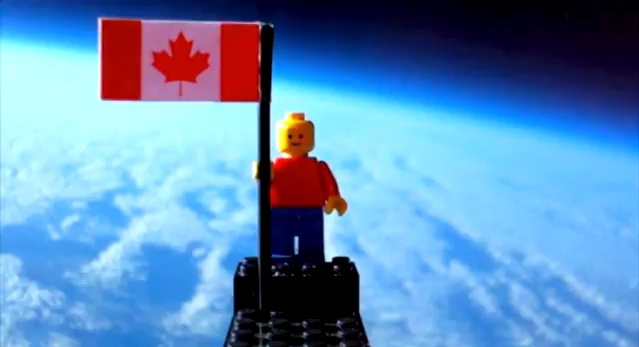 In short, a Lego man grasping a Canadian flag has been blasted into ‘near’ space, gaining the toy brand some nice coverage in the process. A fixed camera captured it all and is well worth a look (see video below). The stunt is very similar to the recent effort from US firm G-Shock, who showed an iPad emerge unscathed from a 10,000 foot drop thanks to their protective case – take a look at that one here. Having just read a piece on The Guardian, it appears that the video is courtesy of two Canadian teenagers, Mathew Ho and Asad Muhammad, both 17, who spent 4 months to make the effort possible. The space mission lasted 97 minutes, using four cameras, at an entire cost of just £254. “We are always amazed by the creative ways in which Lego fans use our products, and humbled by how many unsuspecting places we appear, like attached to a helium balloon in … space,” said the company’s brand relations director, Michael McNally.